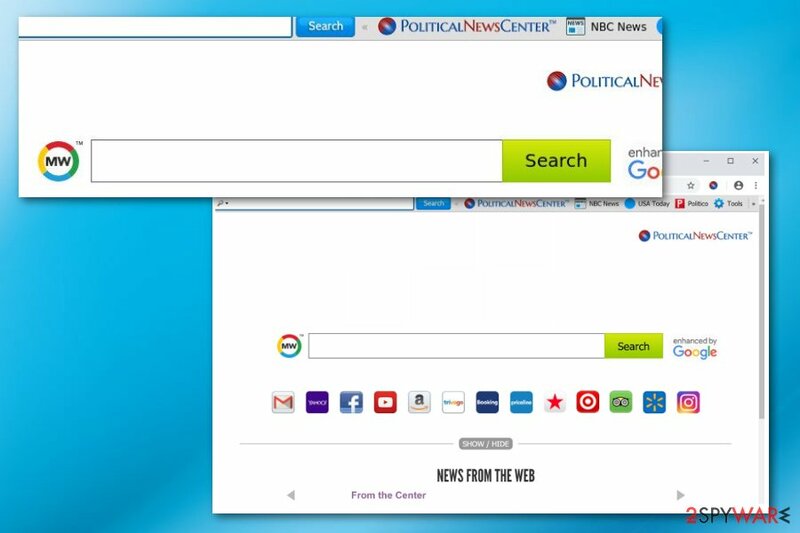 PoliticalNewsCenter toolbar is the PUP that uses misleading techniques to prevent removal. Use Reimage to locate malicious components and get rid of them faster than with uninstall instructions. A full system scan blocks virus reappearance and prevents traffic to malicious domains. PoliticalNewsCenter toolbar is a program related to adware that displays intrusive ads to your screen. PoliticalNewsCenter toolbar is a dubious extension causing your Internet Explorer, Mozilla Firefox or Google Chrome browser to run slow. While initially not malicious, the intrusive activity of the potentially unwanted program is unwanted and frustrating. 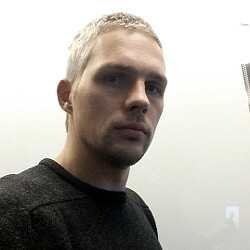 The questionable app is considered to be a browser hijacker because it replaces the default homepage, new tab URL and the search engine of the browser with https://hp.myway.com/ and https://search.myway.com. Additionally, PoliticalNewsCenter toolbar delivers advertisements and creates traffic to sponsored and often dangerous websites. Users who click the generated ads or sponsored links help developers to earn profits from the pay-per-click scheme. PoliticalNewsCenter virus is often called like that by users, however, this application is not malicious. The most annoying and frustrating thing related to this extension is constant redirects and intrusive advertisements. Also, the suspicious toolbar collects various information about your browsing preferences. each click on the ad redirects the traffic to questionable sites. PoliticalNewsCenter toolbar removal should be performed immediately after noticing one of these changes. It is important because data tracking starts the minute this potentially unwanted program enters the system. Researchers advise using anti-malware tools for fully cleaning the system. Reimage could be also used for the optimization and correction of the system, for example, restoring of the Windows Registry. You can also remove PoliticalNewsCenter toolbar by following our guide below the article. There are step-by-step instructions which you need to follow thoroughly if you want to get rid of this browser hijacker. However, additional programs may still affect the performance of your device, so automatic virus termination using anti-malware tools is recommended. You should always pay attention when installing software you obtained online. This is a crucial step if you want to make sure that your device is clean and safe. Freeware providers and PUP developers bundle their products together to make sure that products are distributed widely. During the installation of software, you can de-select additional programs from the list and only get the programs you need. However, you need to choose Advanced or Custom options to be able to do so. People tend to believe the legitimacy and usefulness of these extensions and sometimes willingly install them on the device. To remove PoliticalNewsCenter toolbar, you should use professional anti-malware tools. We have a few suggestions below but feel free to use the tool of your choosing. Anti-malware programs are designed for automatic virus termination and it is crucial when dealing with silent intruders. Also, remember that you can follow our PoliticalNewsCenter toolbar removal guide below where experts prepared step-by-step instructions on manual malware elimination. Here, look for PoliticalNewsCenter toolbar or any other recently installed suspicious programs. Wait until you see Applications folder and look for PoliticalNewsCenter toolbar or any other suspicious programs on it. Now right click on every of such entries and select Move to Trash. When in the new window, check Delete personal settings and select Reset again to complete PoliticalNewsCenter toolbar removal. Once these steps are finished, PoliticalNewsCenter toolbar should be removed from your Microsoft Edge browser. Here, select PoliticalNewsCenter toolbar and other questionable plugins. Click Remove to delete these entries. Now you will see Reset Firefox to its default state message with Reset Firefox button. Click this button for several times and complete PoliticalNewsCenter toolbar removal. Here, select PoliticalNewsCenter toolbar and other malicious plugins and select trash icon to delete these entries. Click Reset to confirm this action and complete PoliticalNewsCenter toolbar removal. Here, select Extensions and look for PoliticalNewsCenter toolbar or other suspicious entries. Click on the Uninstall button to get rid each of them. Here, look at the Homepage field. If it was altered by PoliticalNewsCenter toolbar, remove unwanted link and enter the one that you want to use for your searches. Remember to include the "http://" before typing in the address of the page. Now you will see a detailed dialog window filled with reset options. All of those options are usually checked, but you can specify which of them you want to reset. Click the Reset button to complete PoliticalNewsCenter toolbar removal process. ^ What Is PPC?. Wordstream. Online advertising. This entry was posted on 2018-09-20 at 03:02 and is filed under Stealing programs, Viruses. You can quickly scan the QR code with your mobile device and have PoliticalNewsCenter toolbar manual removal instructions right in your pocket. How did you remove PoliticalNewsCenter toolbar?